Another great blog entry I came across, this time from Today’s Parent. I noticed this for a while now and I’m really starting to get convinced that we may just be… anti-kid. Honestly, prior to being a mother, having people bring their teething infant or set of moody and tired toddlers to a fancy restaurant was never really a big problem for me. Sure, it got a little noisy when trying to enjoy a nice romantic conversation over my filet mignon with the hubs but still so long as food wasn’t flying on me or kids hiding under my dinner table, I was fine. I think it’s really the parent’s discretion. And if they choose to bring their kids, so be it. It shouldn’t be something that’s ‘not allowed’ or frowned upon. 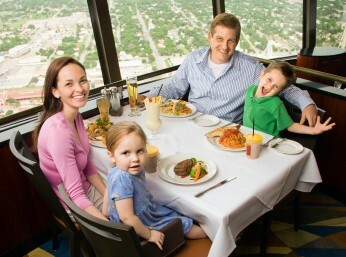 Sometimes we just want to bring our whole family out for a nice dinner, even our toddler! As long as proper etiquette is attempted from all, that’s what matters. And it’s true! Having returned from Paris myself in January, it was amazing how many families with children I seen in even the most pish-poshy restaurants and cafe’s. Stylish mom’s having adult convo with a friend with a cocktail in one hand and a napping infant in the other! Hey, if she can do it? Why not? To each his own I always say. “I just returned from a week in France (a few days in Lyon, and a few days in Paris). It was my first time there, and it was awesome! But besides all the fabulous things to see — Eiffel Tower, Musée d’Orsay, Champs Elysées, Louvre — I really enjoyed sitting out at cafés watching people. And one of the things I really noticed was how many parents brought their kids to what we would consider grownup restaurants. 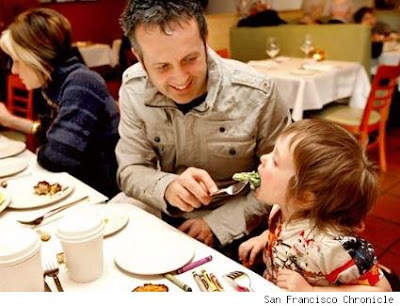 How many toddlers have you seen at a trendy bistro in a major Canadian city? I really loved how kids were just part of everything — not left with a sitter or relegated to some fast food joint. And everyone — the parents, servers and the kids — was relaxed. Funny enough when we were in Paris with our then 2 month old we noticed how there were kids but no babies around! I think Toronto is lot more baby/kid friendly these days. Also we notice kids more now that we have kids.